Breakout Player - 2018-19: Alex Tuch - The Point Data-driven hockey storytelling that gets right to the point. Prior to landing with Vegas, Alex Tuch played only six NHL games since being drafted by the Wild in 2014. He was then traded to the Golden Knights so they would agree to select (and re-sign) Erik Haula over some of their defensemen. Tuch took this new opportunity to post solid rookie numbers. He was 8th on the team with 37 points and 7th with 15 goals. Nothing crazy, but it was an encouraging performance from the then 21-year-old. The most encouraging part of his first season was his stellar net-front play. Standing at 6’4” and 222lb, he has the ideal size to be a massive screen for opposing goalies, but he also has shown flashes of elite play up close. 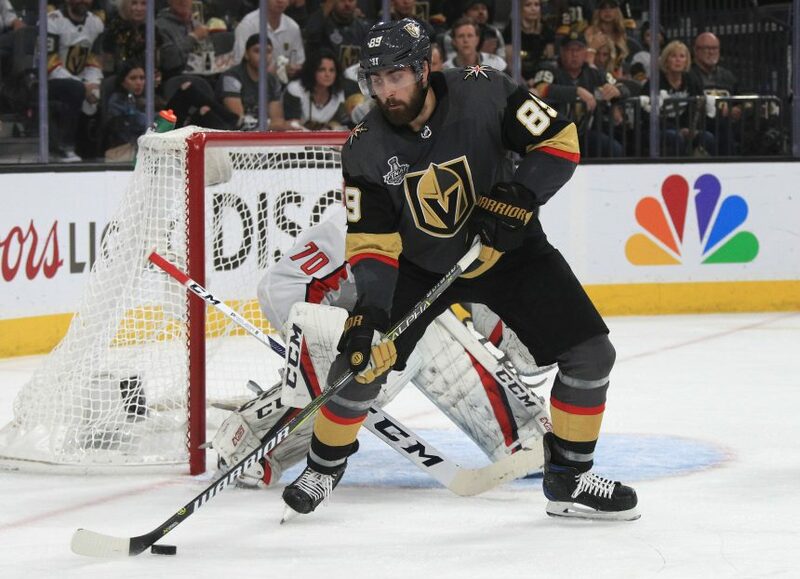 Despite playing only around 15 minutes a game, 7th among regular Vegas forwards, Tuch led the team in inner slot shots with 74, 12 more than second place William Karlsson. If we account for the small sample size by using per-20 numbers, Tuch ranks among the best net-front performers in the NHL. He had the 8th-most inner slot shots in the league and the 5th most offensive rebounds recovered. If he can scale up this performance in a bigger role, he will be extremely dangerous. One of the things Tuch has to improve is his ability to capitalize on the chances he creates. Our expected goals model gave Tuch 23.1 expected goals, second on the Golden Knights. He ended up scoring only 15 goals, a little more than eight goals below his expected total, which was by far the worst on the team. It was also the sixth-worst actual-to-expected goals ratio in the NHL, out of 393 players to play at least 1000 minutes. This comes with the asterisk that his most common even-strength linemates during the regular season were Cody Eakin and Brendan Leipsic, not exactly a pair of offensive dynamos. We had a glimpse of what Tuch could do with more talented linemates in the playoffs, where he was matched up with Erik Haula and James Neal in the top 6. His shooting percentage skyrocketed from a mediocre 8.8% to 13.6% and his actual-to-expected goals ratio per-20 went from -0.14 in the regular season to -0.05, a gap as big as the difference between 12th and 84th during the regular season. Luckily for him, with James Neal in Calgary, there is a permanent opening in the top 6. The top line is pretty much set in stone to start the season, but the right wing spot is open beside Max Pacioretty and Paul Stastny. Tuch has to battle Haula for the spot, but if he can win it, his numbers could skyrocket in a similar way to the playoffs, as both players would be a massive upgrade over playing with Eakin and Leipsic. Now with a full year of NHL experience under his belt, a breakout playoff performance where he scored a point every other game in the top 6 and a chance to play with the best linemates he’s had in his short career, Alex Tuch is definitely a name to watch. If he cracks the top 6 and finds chemistry with Pacioretty and Stastny, he could crack 20 goals for the first time of his young career.